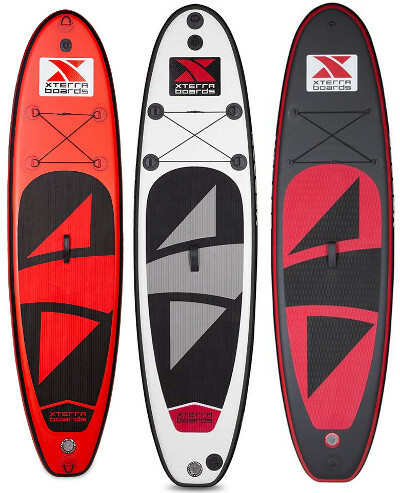 Xterra can be easily described as a luxury brand because it truly creates some of the best inflatable stand up paddle boards in the market. With so much competition, it has become almost impossible to tell which brand is better but one look at an Xterra iSUP will pull you right in. Truly, this brand’s creations radiate quality and that is why we’re reviewing some of its best products today. 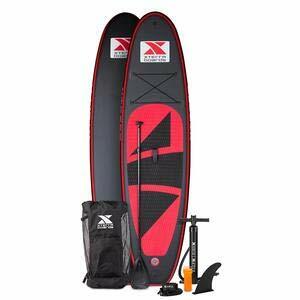 The Xterra Boards 10′ Premium Inflatable Paddle Board is a living example of the brand’s legacy. Indeed, this is one of the brand’s best selling inflatable paddle boards out there because it reflects quality, style and variety. Indeed, the Xterra 10’ is a beast of a board that comes in a variety of colors including black, orange and white, granting you more freedom to truly choose the board you desire. Before diving deeper into style, we ought to take a stop at quality town because Xterra inflatable sup has a lot to say about that. Undeniably, the Xterra 10 footer is a giant and that requires some tough skin to keep it together. Hence, the brand features a multi layered military grade PVC coating, which is further enhanced via an immaculate drop stitch construction that makes this iSUP hard to tell apart from a hard board once inflated. Accordingly, the Xterra 10’ iSUP is guaranteed to endure the toughest environments and lead you along a worry-less journey of fun & joy. Design is the actual selling point of this board and you can see exactly why. Undeniably, Xterra 10’ iSUPs look so good that you’d struggle to decide which color to go for. However, what’s even more important than design is size and that’s an area of speciality for this board. Indeed, the iSUP at hand measures a universal 10 feet in length, making it the perfect fit for the widest range of paddlers out there from youth to full on adults. Further, the board stands at a steady 30 inches in width to reinforce stability and balance, making it one of the best entry level boards on the market. Moreover, with a 6 inches thick hull, you can’t really go wrong because it pushes the weight limit on this board up to 250 pounds. 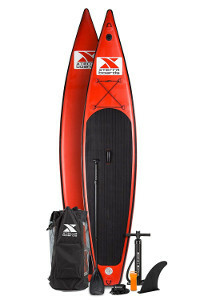 First, the 10 footer features a cool design gripping pad that helps the paddler remain on top and in control of the board despite the environment. The board also features a nifty cargo net to secure your personal belongings. You also have a couple of much needed D-rings on the nose and tell to tow / secure the board. This Xterra features a much needed central carry handle for easy transportation. Lastly, the 10 footer showcases an impressive triple fin navigation system that will aid the board glide and manoeuver better. The components on a package are often a huge contributor to your experience because they can truly facilitate your interaction with your board. 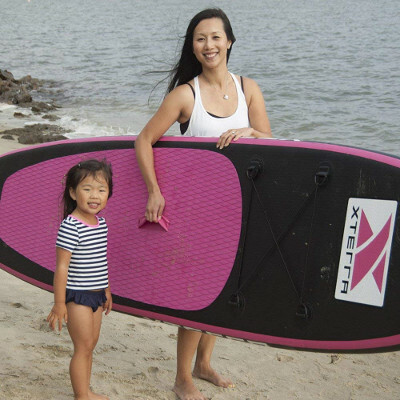 Xterra is a brand of choice and that entails creating a variety of boards that fit different profiles perfectly. Hence, it wasn’t a surprise to learn that the brand actually developed a board specifically for women. 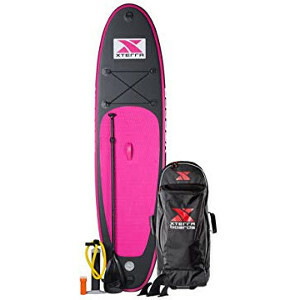 Yes, the Xterra pink inflatable paddle board is a custom design meant to lure in female paddlers as it caters for their specific needs and aspirations. Quality doesn’t vary significantly from one board to another which is why shouldn’t expect nothing less than the best from this board. Indeed, the board at hand is developed via military grade coating which is then further reinforced through an industrial drop stitch technology. This unbreakable combo makes this board capable of enduring any environment from white water all the way down to steady lake yoga. Ask any woman and she’ll tell you that size matters. Hence, the Xterra stand up paddle board at hand goes directly for safe dimensions that are guaranteed to cater for most women out there. Accordingly, the board measures a universal 10 feet in length which is splendid for young or adult women alike. 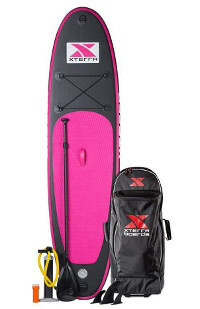 Also, this Xterra inflatable paddle board features a 30 inches wide platform which is meant to induce stability and help you balance yourself out easily. Further, thickness remains at a humble 4 inches since this board is developed to cater for a maximum weight capacity of 200 pounds only. The pink gripping pad is the most attractive feature of this board since it is large but most importantly it is very grippy, giving you a needed grip and a much easier command pose. Further, this 10 footer also comes with a central carry handle for easier transportation and a triple fin navigation system for a steadier more responsive ride. To ensure its reign over most categories, Xterra Boards had to make a special edition for touring lovers. Accordingly, the brand might have created what could be the complete touring inflatable paddle board. Nonetheless, does it stand by the brand’s guidelines or is it a rushed extension? Well, since we like to talk about quality so much, we aren’t going to let this board slide. 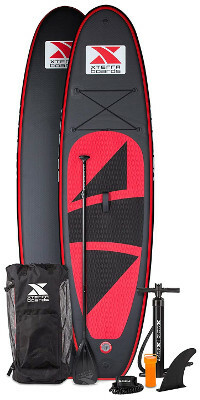 Indeed, this Xterra inflatable sup is easily one of the toughest touring boards on the market because it religiously adopts the Xterra Boards creation method. Hence, the board features a thick multi layered military grade PVC coat with a hot welded drop stitching process that truly glues the hull together. 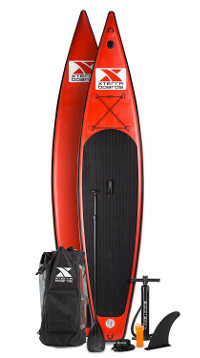 Thus, the Xterra stand up paddle board is fit for any and every environment on the spectrum as it is promised to last a life time of experiences. 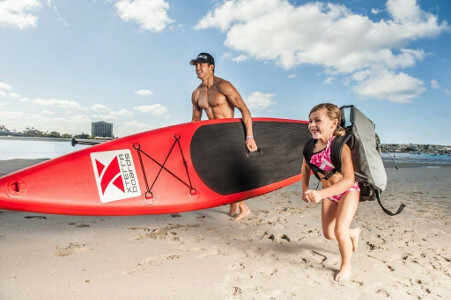 Since size is critical for touring boards, the Xterra stand up paddle board at hand took no chances and went for the safest dimensions to cater for the widest range of paddlers. Accordingly, the board measures a dazzling 12 feet 6 inches in length, giving it the steadiness and serenity a touring board needs. Also, this Xterra abides by the 30 inches rule which will make it a little harder to handle for complete beginners but highly responsive for someone familiar with paddle boarding. Further, the board comes at a respectable 6 inches in thickness that raises the bar of its maximum load capacity to 250 pounds.